Winners of the Design Journal's award for design excellence for it's striking aesthetics and smart engineering these Eclipse trash receptacles would add some excellence to just about any indoor setting. 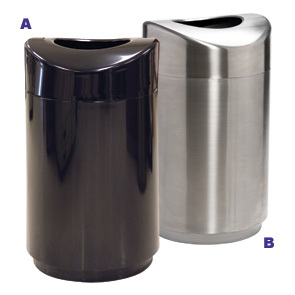 The Eclipse trash receptacles are constructed from heavy gauge fire-safe steel that is finished in a non-magnetic stainless steel finish or durable powder-coat finish. The smart design features sanitary hands free pitch in disposal with a curved or arched top surface that effectively prevents any undesirable waste to be place upon. The Eclipse is recommended for indoor use only. All receptacles include a 30 gallon leak-proof rigid poly liner.